Nagomi @Cuppage Plaza (Singapore) | Get Your Grub On! After returning from our short trip I had planned a treat for my visitors by booking a table at one of my favorite special occasions Japanese restaurant, ‘Nagomi’ at Cuppage Plaza. It’s difficult to tell if you’re at the right place until you stick your head through the noren at the entrance and realize you just found a little piece of Japan in the middle of Singapore. ‘Nagomi’ is very small with only four tables and a bar and had a traditional yet modern Japanese interior. Light is dimmed and urn like pottery filled with aging ‘Shochu‘ of regular customers is covering the shelves. They import their ingredients directly from Japan and change their a la carte menu very regularly depending on what’s in season and currently available. Since this is only available in Japanese we decided for the eight course ‘Omakase‘ (chef’s menu). 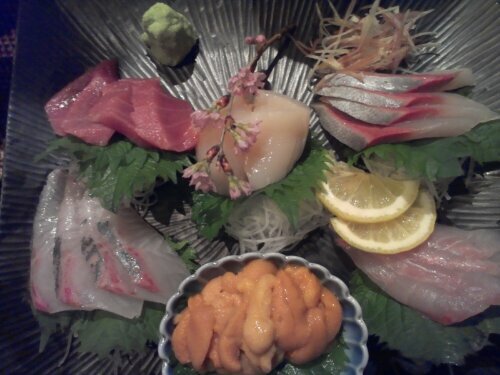 The second course was a fabulous sashimi platter with ‘Uni‘ (sea urchin), ‘Hotate‘ (scallop), ‘Maguro‘ or ‘Toro‘ (tuna/tuna belly) – I didn’t ask but it was definitely a fattier piece – as well as three other fishes I forgot the names but each one of them was super fresh and had a soft texture which I prefer so much to tough bites. I asked at the beginning if they had their amazing ‘Slow Braised Pork Belly‘ and was rather disappointed when I heard it was not on the menu but only until I found out what took it’s place: ‘King Crab‘. This portion was humongous and the flesh was so sweet and needed nothing more to it to make it truly amazing. Next up were two whole ‘Kinki‘ fish in a light and superior broth. The fillets fell off the bones and were nice and soft. 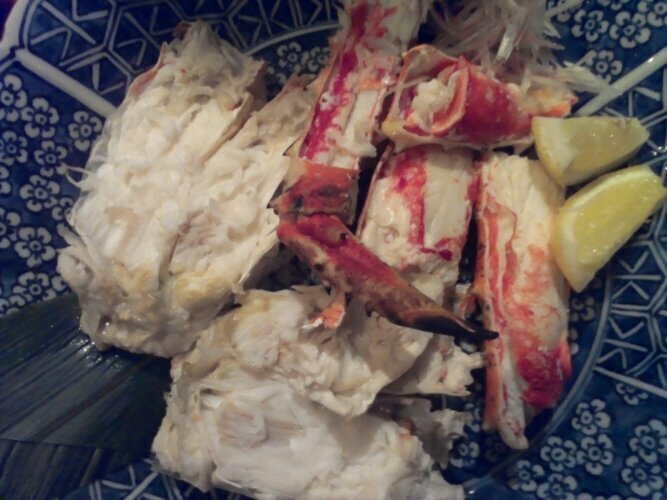 There weren’t too many bones in it but the few were tiny dangerous and difficult to separate from the fish once in your mouth. 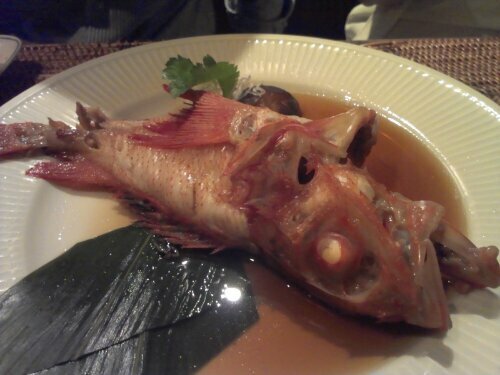 We continued with big fried ‘Deepwater Fish‘ (similar to sardines) which, except the heads, were still completely intact and covered in a nice Japanese batter with dipping salt aside. Once I got over the thought that the first bite included the tiny innards of the fish, it tasted delicious and was nicely juicy. 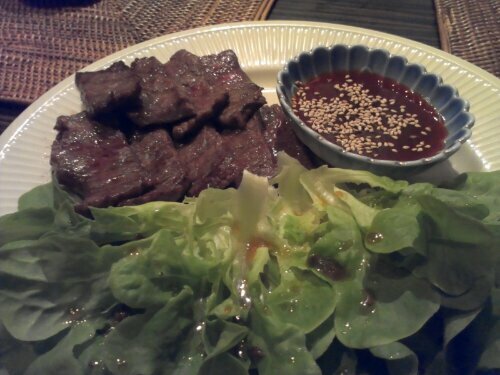 Following the fish we did get ‘Grilled Wagyu Beef‘ together with a sweet dipping sauce and wrapping lettuce drizzled with a wafu vinaigrette. It tasted great but the meat had some thin tough parts which made it difficult to bite pieces off. The seventh course was ‘Japanese Porridge‘ which tasted nicely simple but delicate and was nearly a bit too much after all the other dishes. We took a bit of a break before closing our menu with some lovely sweet ‘Japanese Strawberries’. Of course this is not a place for everyday dining, mainly because of the over one hundred dollars per head (not including drinks), but for special occasions or if you just want to take your time (around 2 hours++) and celebrate great quality food, this is the place. Domo Arigato Gozaimas.